Restored Early 1960's. First went into service on the opening of the Ferrymead Tramway in January 1968. Kitson Steam Tram number 7 is probably the most iconic vehicle in the Society's collection - and is depicted on the Society's logo. (This vehicle is generally referred to as "Kitty" by Society members.) It is believed to be one of only three Kitson Steam Trams that remain in existence, and the only one still in operating order. The Steam Tram is one of eight imported by the Canterbury Tramway Company in 1880/1 for use on that company's lines in Christchurch. Numbered 7 by the company, it was maker's number 28 and was built by Kitson & Company, Airedale Foundry, Leeds England, in 1881. 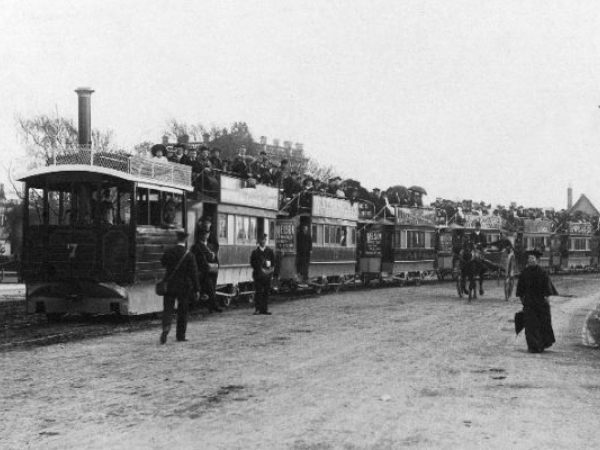 Although they were used primarily on passenger services, they also saw service on track maintenance and construction work until well after the electrification of the tramway system was complete. 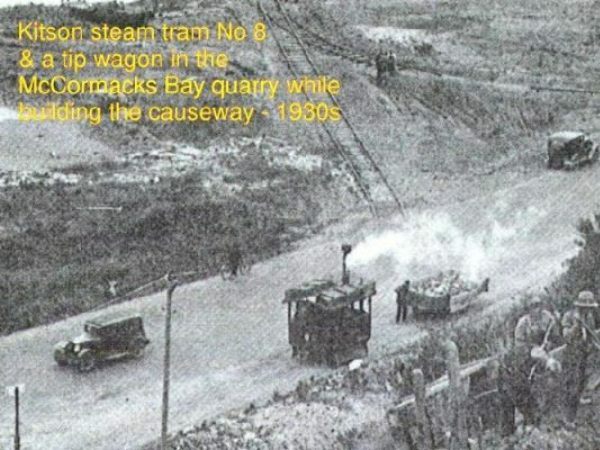 They were also used during the construction of the McCormacks Bay causeway (a road deviation across tidal mudflats), the conversion of the North Beach line to trolleybus operation, and shunting of trailers in Cathedral Square. Regular passenger use ceased in the mid 1920s but continued to be used for occasional specials through the 1930s. Four steam trams - numbers 3, 6, 7 & 8 - were still available for service during the 1939-45 war (in case they were required as a result of enemy action) and all four were reconditioned in 1942. No 3 was scrapped in 1944, and the others were stored. Kitson no 7 along with two trailers were overhauled and ran special services in 1950 to mark the Canterbury Centenary, and number 6 & 8 were scrapped in 1951/52. Ownership of number 7 remained with the Christchurch Transport Board who placed it in the care of the Tramway Historical Society in the early 1960's, and overship was eventually officially transfered to the Society. The tram was restored and returned to service in January 1968 with the opening of the Ferrymead Tramway. The Kitson received a major overhaul in the mid 1980's. 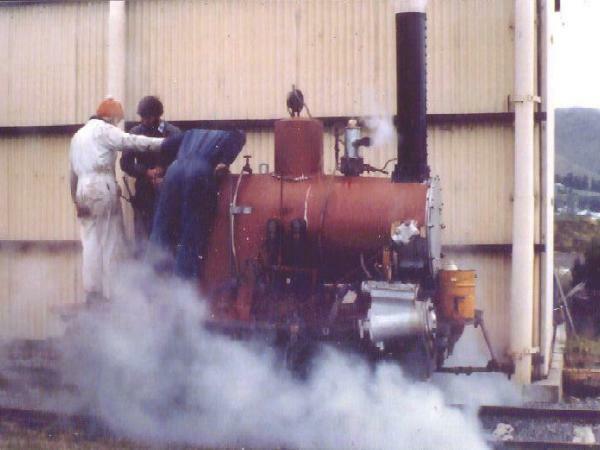 Then following many further years of service on the Ferrymead Tramway, the Kitson was taken out of service in 2002 for some major boiler work after failing an annual boiler inspection. It went back into service just prior to Labour Weekend 2003. During Labour Weekend 2003, the Kitson (and cage trailer No. 74) were trucked into Christchurch, and did three laps of the City Tramway circuit. This was the first time the Kitson had been running in the city for 50 years. In 2007/2008, the Kitson received another substantial overhaul. In particular, a number of firebox stays were replaced, some repairs to the motion were made and the Kitson received a repaint. The Kitson continues to run regularly on the Ferrymead Tramway, generally on the first Sunday of each month and on event weekends, where it can be seen pulling one or (generally) both of the Society's restored double deck trailers - numbers 10 and 74. The society has also obtained a second-hand boiler (originally ex Kitson number 6) and is being overhauled and will eventually fitted. Note: The Kitson was design to burn coke rather than coal - as this is essentially a smokeless fuel - and as such considered to be less polluting. 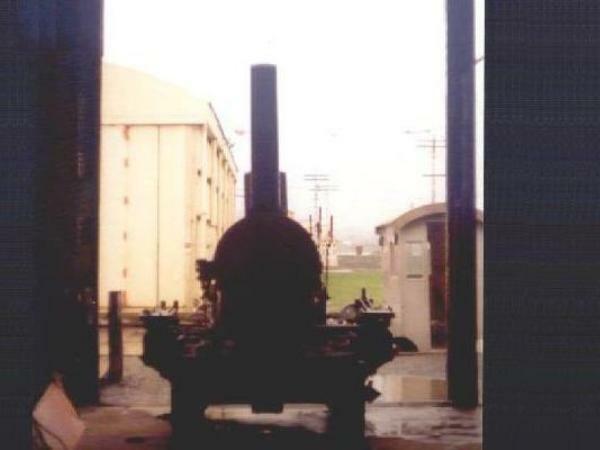 (That is also why the photos never seem to show black smoke from the funnel). The Society is always on the look-out for further supplied of coke. If you have some that you don't require, please contact the Society as we are always interested in obtaining more.